When you think meat and you think Germany, you probably think bratwurst, frankfurters, or all the other sausages that represent the country so well on a plate. The funny thing is that there are just as many traditional meat dishes in the country's culinary repertoire. The country does have a meat and potatoes reputation. 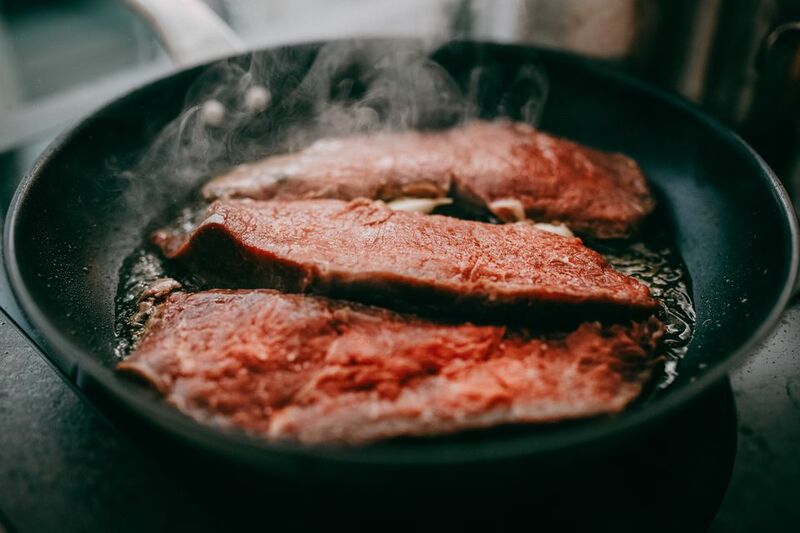 Schnitzel, sauerbraten, stews, oven and pot roasts, and geschnetzeltes (stir-fries) are all wonderful ways to enjoy the flavors of German in a meat-packed meal. Even, the ever popular hamburger is a word that originated in Germany, named after one of the largest cities in Germany, Hamburg. 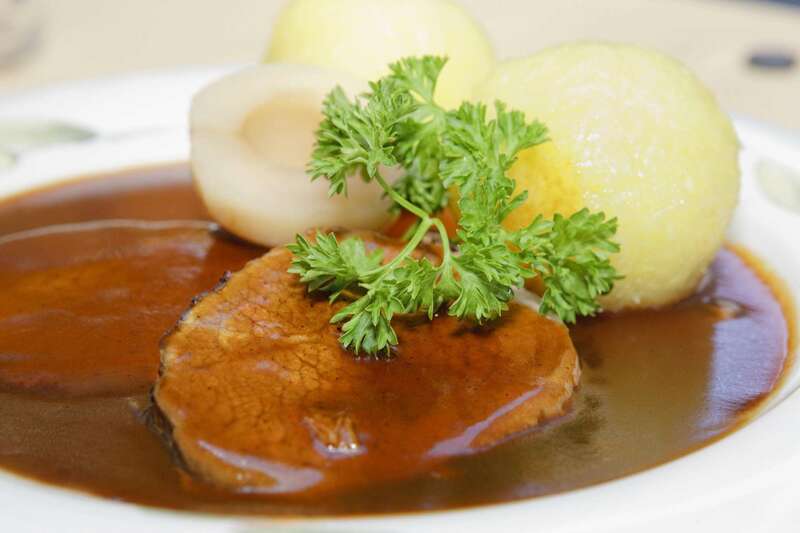 Check out all of the ways you can make easy-to-prepare German main dish recipes with meat. In German recipes, if you see the word schwein, you are looking at a pork recipe. As you can probably tell, the English word "swine" is related to the German word. Another word to know is braten, which simply means roast meat. Roasts are easier to make than you might think. Try your hand at one of these beef or pork roasts. Hamburg, Germany, is the second largest city in Germany and is believed to be where the popular American dish, hamburgers originated from. Many references point to the first "Hamburg steak" being served between two pieces of bread on the Hamburg America Line, the transatlantic shipping line between Germany and America. Most hamburger recipes usually use a mixture of ground pork and beef. The ground pork adds moistness to the finished dish. You can interchangeably use ground beef, ground veal, or ground turkey as you see fit. Most everyone has heard of wienerschnitzel. But what about hunter's schnitzel or gypsy schnitzel? When you see schnitzel in a recipe, it is usually a pounded meat usually cooked like a cutlet. The word comes from the German sniz meaning "slice." Chicken is popular in Germany and they are many tasty ways of preparing it like roasting, grilling, or in a sauce like the recipe below. If you are looking for a traditional roast chicken then what you are looking for is brathähnchen or hendel. You can simply season the whole chicken with salt and pepper or spice it up with paprika, coriander, sage, fennel, rosemary, or caraway seeds. After an hour in the oven, your bird is cooked. German stir-fries or sautés are made with veal, chicken, or thinly cut strips of pork. Usually dressed in a cream sauce, they make a thoroughly delicious comfort food dish when served with spaetzle noodles, rice, or potatoes. These stew-like stir-fries are popular throughout Germany and Switzerland, some versions are named Züricher geschnetzeltes for the Swiss capital city. It is ideal for the busy cook since it only takes about 30 minutes to make.